Phil Solomon has been making films since 1975 and is currently a Professor of Film Studies at the University of Colorado at Boulder, where he has been teaching since 1991. 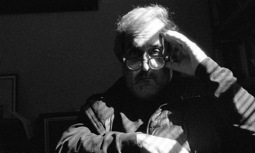 He collaborated on three films with his friend and Boulder colleague, the late Stan Brakhage, who named Solomon's Remains to be Seen on his Top Ten Films of All Time list for Sight and Sound. He is currently working on A Snailʼs Trail in the Moonlight: Conversations with Brakhage, a video essay and a book of transcriptions of several years of recordings of Brakhageʼs Sunday film salons. Phil Solomon has been awarded with a USA Artists Knight’s Fellowship (2012), the Thatcher Hoffman Smith Creativity in Motion Prize (2007), a Guggenheim Fellowship (1994), and he has exhibited his films in every major venue for experimental film throughout the US and Europe, including 2 Whitney Biennials and three one-person shows at MoMA. Solomon’s films have won First Prize at numerous international film festivals, including Oberhausen and Black Maria (6 Juror’s Awards for Clepsydra). His recent Grand Theft Auto digital video series, In Memoriam, has received numerous awards and was named in the Top Ten avant-garde films of the year by the Village Voice. In a recent poll taken by Film Comment of the top 50 filmmakers of the first decade of the new century, Phil Solomon was placed at number 5 (tied with Stan Brakhage).